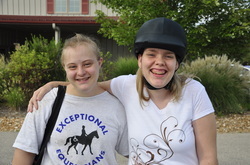 About Us - Exceptional Equestrians of the Missouri Valley, Inc.
For more than 28 years, EEMV has been helping those with disabilities by providing them with one of the greatest tools ever......the horse. The benefits of equine assisted activities and therapies (EAAT) are as numerous as the types of disabilities and conditions served. Research shows that people who participate in equine assisted activities & therapies experience physical, emotional and cognitive rewards. The three-dimensional, rhythmical motion of the horse's movement stimulates the muscles of the rider, thus providing great therapeutic effects for those with physical disabilities. For individuals with cognitive or emotional disabilities, the unique relationship formed with the horse can lead to increased confidence, patience and self-esteem. In addition, each new skill learned creates new pathways in the brain and facilitates attention and learning. The Professional Association of Therapeutic Horsemanship International (Formerly NARHA), assures all accredited centers uphold the highest safety standards in the industry. In order to become a Premire Accredited Center, EEMV had to meet more than 90 standards in areas such as administration, faciillty and program. EEMV is proud to have been one of the first Premier Accredited Centers in 2002 and recently received our accredidation for 2017-2022. For more information about PATH, click here or at the logo to the left.